A number of friends have asked me if I have heard about Madeline Stuart, the first model who happens to have Down Syndrome. I think she's great, and I think her mom must be amazing as well, to have encouraged her daughter to go after being a model, even when this hadn't been done before. 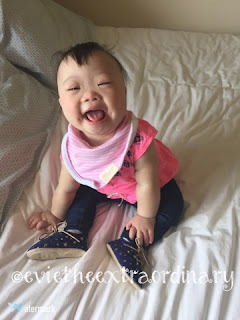 There's also Gigi, another up and coming model who wants to show the world that people with Down Syndrome should not be limited by people's assumptions. I'm so inspired by these young women. Evie is Mommy's model! I have dreamed of dressing up a little daughter for years, and now I get to. No, I am too young to watch the Kardashians. But thanks for asking. I can't tell you how excited I am about Halloween. There are too many cute possibilities for costumes. I have looked forward to dressing up Evie for Halloween since I knew we were pregnant with her! But today's post is about clothes. Clothes for kids with feeding tubes. 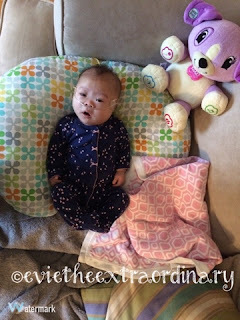 Things can be different for a kid with a tube coming out of her stomach. When Evie was in the NICU, she wore the snap front sleepers. 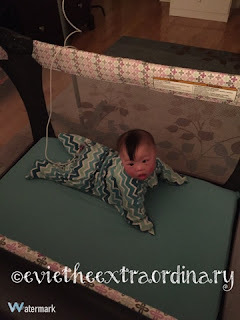 This was fine because Evie couldn't roll over yet or pull at her many cords. She had an oxygen tube and an NG tube, which is a feeding tube through her nose down her throat, so there was nothing attached to her tummy. When she got the G-tube through her tummy though, this changed Mommy's whole wardrobe scheme. She actually had a G-tube at this point, but just had to show off my tiny Evie in one of my favorite snap front sleepers! At 5 weeks old, Evie got a G-tube, which is a feeding tube connected through a port that was surgically inserted into her stomach. As you can see, the G-tube comes out on the side of her, so if she's wearing a zippered sleeper, there's no opening for the tube to come out of her clothes. 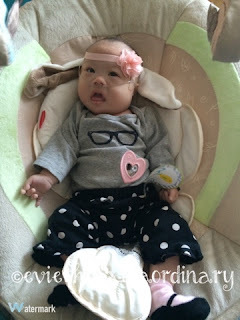 I wanted her to wear this penguin sleeper so badly, that I put it on anyway. I will admit right away that I am a Carter's store fanatic. I always know what new prints are out for baby clothes at Carter's. And the sad thing is that Evie cannot wear many of them. For example, the cutest little penguin sleeper is at Carter's. But Evie can't wear this because there's no opening for her G-tube out to the side unless I cut a hole in the sleeper. Sad face. Luckily last winter we had nice snap front sleepers! Another non-tubie friendly sleeper with a penguin on it. Mommy is sad Evie can't wear this one. If you haven't noticed yet, I love penguins. All summer, Evie mostly wore rompers from Carter's. I was ecstatic to see that they had these, and bought as many as I could. 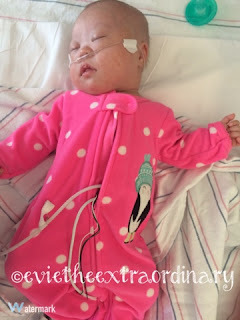 These snap front rompers were perfect for the summer, since the G-tube could come down the side of her leg. Onesies were okay, but I had to hike up the side of the onesie to access the G-tube port (and give Evie a wedgie for a second), so they weren't as nice as the rompers. Here is a onesie that I loved so much, that I got a Tummy Tunnel to try to be able to use onesies, long pants, and a G-tube. I now regret doing it that way because it left a draft, but at least it worked when I needed access to the G-tube port. Dresses work too, but a girl doesn't need to get all fancied up every day! I took it for granted that Carter's would always have snap front clothes. That is apparently not true this season, and it's still too cold for the fleece snap front footed sleepers. And I can't find any snap front cotton sleepers without the footed part! Now that fall is here, we can't live in rompers anymore. So it's time for long pants! This is a new thing for Evie and her mommy, since she wore sleepers last winter. We were used to threading the G-tube down the leg of her romper, but it's not as comfortable for her if we thread the whole tube down a long pant leg. So Mommy's answer to this is tunics! Tunics and long pants! Tunics are better than regular shirts because the length of the tunic covers up her g-tube button a little more. Every girl should have socks with pompoms on them. I look healthy BECAUSE I'm a tubie! For sleeping, Evie is transitioning into big girl pajamas. By big girl pajamas, I mean not sleepers, and actually shirt and pant pajamas. We put her in shirt and pant pajamas, and this leaves great access for the g-tube, and then we put the Zipadee Zip sleep sack on, and she's off to dream land! For the full fashion story about Evie, we can't leave out swimsuits. Tubies can wear swimsuits too! 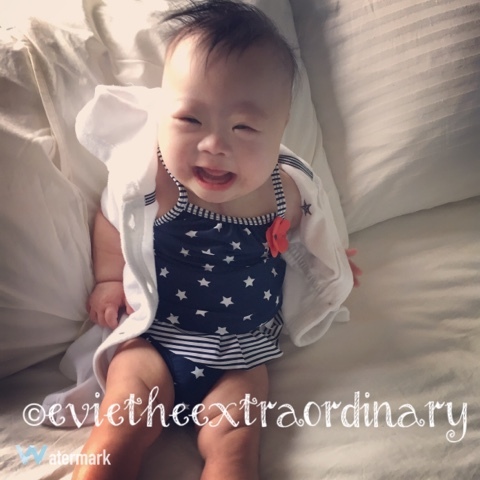 Here Evie is sporting a tankini with a light beach coverup, all with a salute to her love for the United States of America. 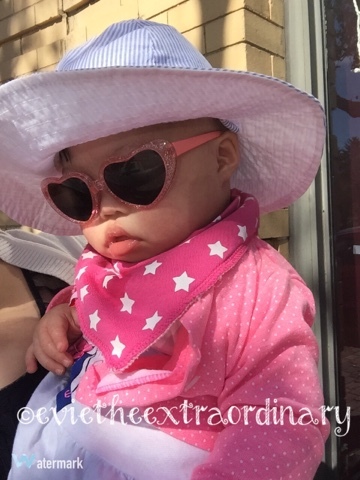 Thanks for reading about Miss Evie on the catwalk! 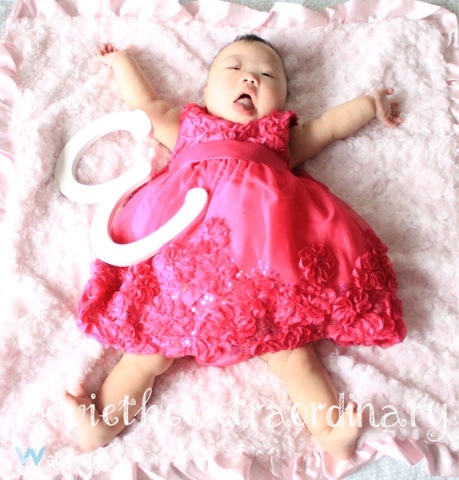 She will take modeling gigs at a later date so she and Mommy can travel around the world. Thanks for reading, my fantastic fans! 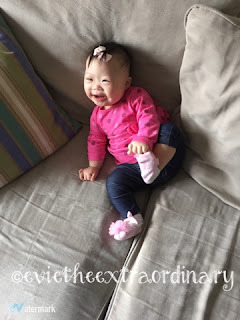 Happy Down Syndrome Awareness Month! We hope you are learning from our blog! Evie is gorgeous! And quite the model!